Welcome to Irina's page! Come back often for new tips on healthy living. Visit this page to see where I buy my ingredients. Awesome Soup of the Month (March): Organic Veggie Feast with Quinoa. Serve this awesome soup when you want to add a touch of sweet to your savory palette. Awesome Soup of the Month (February): Kharcho - Organic Georgian Lamb Soup. Serve this awesome soup when you are so cold that the very thought of "spicy" warms you up and lightens your spirit. Serve this awesome soup any day, everyday, when you have the snuffles or when you need basic comfort food. Serve this awesome soup when you crave something warm and savory. Serve this awesome soup at the start of your Thanksgiving meal. Serve this awesome soup when watermelons are abundant at your local farmers market. Serve this awesome soup warm or chilled depending on the onset of Indian Summer. Serve this awesome soup when fresh tomatoes are in season. Serve this awesome soup to stay cool during a summer heat wave. Serve this awesome soup when first greens of the season appear in your garden or at a local farmer's market. Serve this awesome soup when your herbs start blooming, but new season veggies are still a month away. Awesome Soup of the Month (April): Russian Cabbage Soup. Serve this awesome soup as your farewell to dreary winter days (which can happen in April if you live in Midwest). Awesome Soup of the Month (March): Organic Cauliflower and Carrot Soup. Serve this awesome soup when you smell daffodils in the air. Serve this awesome soup when it's freezing outside and you feel like something spicy. 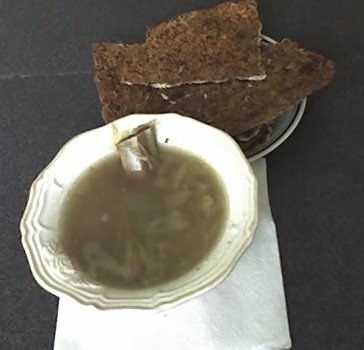 Awesome Soup of the Month (January): Organic Black Bean and Lamb Soup with Caraway Rye Bread. Serve this awesome soup after skiing or for a cozy evening by a fireplace. Serve this awesome soup on a cold sunny day when you are dreaming of a warm salad. Serve this awesome soup on a chilly day for a hearty lunch or an early supper.